Source: I purchased my own copy. I have wanted to read Seraphina since first hearing about it, but like so many other books, it took me awhile to finally get around to it. I suspected I would like it, and I did. Seraphina is such a relatable character. Smart and insecure. Thoughtful and compassionate. She is someone I could see being friends with. All her life, Seraphina has had to hide a part of herself or risk terrible consequences. But she also knows she cannot hide at home forever, protected by her father. She has dreams of her own and so takes a job with the royal family. There she finds her confidence and learns she has much more to offer than she ever imagined, both in her music, her knowledge, and her very life. I found Prince Lucien to be quite dreamy too, or at least I would have if I were a teenager like Seraphina. He's extremely bright and perceptive even in spite of his young age. He's had to be though, given his background. He has his own cross to bear, which has made him a stronger man in many ways. Princess Glisselda proves to be a valuable ally to Seraphina over the course of the novel. She has a good heart and a good head on her shoulders. Sometimes I forgot she is younger than Seraphina. There were many other characters that both helped and hindered Seraphina as she and Lucien worked together to uncover who was behind the murder and the attempts to destroy the fragile peace between the dragons and the humans. I was most fond of Seraphina's mentor, a dragon, whose attempts to remain untouched by Seraphina were so obviously feigned. It was clear he cared for her. If I had one complaint about the novel, it would be that I didn't quite buy into how easily Seraphina was accepted into the murder investigation and in finding out who was behind the attempts to destroy the peace between the human and dragon species. Yes, she seemed to have more knowledge of the dragons than most of the humans in the realm. But she was so young and innocent--that Lucien would put her in danger so easily was hard to believe--and yet, it also could be seen as a sign of respect to her--treating her as an equal, which serves its own purpose, I suppose. It really was a minor thing though in the scheme of things. I was caught up in the novel and the world Rachel Hartman has created. The idea of dragons being calculating and unfeeling, more interested in science and math, is a unique one. There ability to transform into humans and attempt to assimilate was an interesting twist. It's obvious both humans and dragons have skills and abilities that can benefit each other. And yet, even as the two species live in peace, it is a fragile peace. The humans still fear the dragons, especially in Goredd, and do not fully accept them. The dragons are not free to be themselves, not completely, forced to remain in their human forms the majority of their time and adopt the ways and beliefs of the humans. In Shadow Scale, the second book in the duology featuring Seraphina, the peace between dragons and humans is in a very precarious position. Civil war between the the dragons threatens to boil over into the human lands. The humans are divided as well. Support the dragons who are willing to live alongside them or fight them all because of the threat they may pose. Goredd's very existence is at risk and the leaders are doing what they can to keep war from coming their way. Their options are extremely limited, and so they turn to Seraphina, whose special gift may be the only way to save their kingdom and the kingdoms around them. With the Crown's approval, Seraphina sets off to find others like her, in hopes of finding a peaceful resolution. She also has another motive in searching out these others. All her life she has felt like an outcast and she hopes that in bringing others like her together, she will finally feel like she belongs. It isn't as easy as she anticipates, however. Seraphina meets resistance on many fronts--including someone with his or her own agenda. As Seraphina is away, a new evil comes to Goredd, threatening everything Seraphina holds dear. Seraphina is more of a straightforward novel. Whereas Shadow Scale takes everything to an entirely new level. As someone who finds the history of religion fascinating, I thought Hartman did an amazing job of developing the mythology and history of her world even more. We see some of that in Seraphina, of course, but it really comes to light--and under scrutiny--in Shadow Scale. I did feel that Shadow Scale had less focus in some spots and would like to have seen some elements, particularly in terms of Seraphina's character, come out sooner. It all seemed so rushed at the end--at least in that one regard. I thought the opening and end of the story, the way it was told was a nice touch, especially given the story Shadow Scale tells. Seraphina learns some hard but necessary lessons in Shadow Scale, and I appreciated how the author did not make it easy for her heroine. It added to the gravity of the situation as well as the realities of life. Both Seraphina and Shadow Scale see Seraphina try to figure out where she belongs, struggle with insecurities, and come into her own, all of which young people today can relate to--and maybe even some of us in the older crowd. Shadow Scale takes it even further, delving into behavior and motive, and how our past can play a part in both. As well as reminding us all actions have consequences. I heard a rumor that the author is writing another book set in the same world as Seraphina and Shadow Scale. I hope it is true! There are so many directions she could go. I look forward to seeing what else she has in store for us. To learn more about Rachel Hartman and her work, please visit the author's website. She can also be found on Goodreads and Twitter. I have Seraphina on my shelf right now- I think I will like it a lot too, but just haven't gotten around to that read. I didn't realize Seraphina herself was a teen in the book. Interesting about the dragons turning human and being cool and calculating- the ones in Barbara Hambly's Dragonsbane series are also rather like that, although the world and situation is very different and the changing form only happens with one dragon, in the third or fourth book if I remember rightly. Jeane - I hope you do like it! I believe she's 16 in the book. Considering the time period, I imagine 16 is not quite the same as it is today. I have been wanting to try Hambly's series. I have heard good things about Dragonsbane. As much as I am into dragons right now, I really haven't encountered many of them in my reading. I need to work on that. Jenclair - I hope your library gets it in. I'd like to know what you think of it if and when you do read it. I have Seraphina a few times and I loved the cover but wasn't sure it was for me because I don't read much YA and I don't read much fantasy. However, since reading and loving Cinder and Scarlet I've been wanting to expand my genres a bit and this is one that has caught my eye. I think I'd really enjoy these 2 books and I love that Seraphina is so likable and relatable. Katherine - It's definitely more high fantasy, so it would give you another side of the fantasy genre. I really liked that about Seraphina too. She's a great character. I read Seraphina a couple of years ago and really enjoyed it, but I haven't read the sequel. Yet. :) I liked Hartman's unique take on dragons. Glad you reminded me about these books! Lark - I enjoyed that part too. I hope you get a chance to read Shadow Scale. There's a section in the beginning that nicely recaps the events in Seraphina, which will help if it's been awhile since you read the first book. My sister has read this series and she really enjoyed it, I haven't read it myself though. i am glad to hear you enjoyed these two books. I like the sound of the how the dragon topic is handled, it sounds original! Great reviews! Lola - Thank you! I loved the history. The author really put a lot of work into the world building in this one. I bought Shadow Scale like ASAP and shockingly still haven't read it... I am looking forward to it, though! Kailana - That sounds like something I would do. :-) I am glad I finally read both of these. Melody - I hope you enjoy them if you do read them, Melody. They are on the long side, but read fairly quickly. I like these covers. They both sound good especially since the heroine learns some lessons along the way. Glad you enjoyed these. Great reviews! Naida - I like it when a character grows over the course of the book (in this case, two). Sarah - It's worth reading. I hope you get a chance to read it! I have had "Seraphina" sitting on my shelves for quite some time now, and have yet to read it.... I have so many books in that "TBR limbo"! Lol. Of course, the cover pulled me in right away! 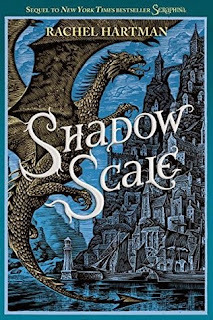 I also love the cover of "Shadow Scale". I must get to the first book sometime this year, so I can then start on the second! I really like your idea of reviewing both novels, back to back. It gives continuity to the overall story. And your reviews are fantastic! You have some very interesting thoughts on the plots and characters in each book, yet don't include spoilers. GREAT job on both reviews!! Maybe this is the kick in the pants I needed....lol. Maria - As you can see, it took me a while to get to it too. :-) I really like the covers of these two books too. I hope you enjoy the books if you read them, Maria. Thank you for your kind words! I try to leave out any major spoilers. I find I can do that better when I review books like this together. Although not always as successfully. One of many on my TBR, though higher than most. I haven't seen any negative reviews (though I haven't looked for them; guess there's some on GR) so it's good to read about what you thought didn't work amongst all the good stuff. Interesting the way the story changes in the second book, from a general novel to something more. Always good to hear that. Charlie - Our TBR piles are very high, aren't they? I've read some mixed reviews of the second book in particular, but mostly good reviews of the first. I really enjoyed both books, even despite my misgivings.